I’m delighted to present another in my ongoing series of guests posts contributed by black women and other women of color. Please submit yours! I welcome post drafts or ideas for posts for consideration; email me at gettenure@gmail.com. I pay $150 for accepted posts. The posts can be anonymous or not, as you prefer. I welcome content on #MakeupMonday (the initial impetus was a Twitter follower asking for #MakeupMonday posts oriented toward women of color) as well as anything related to the academic and post-academic career. Today’s post is by Linh Anh Cat. Linh Anh Cat is an ecologist starting her career in science policy, and an ABD at UC Irvine. She loves brunch, the beach, and serious board games. You can find her tweeting from @LinhAnhCat. Earlier this year, I decided compete in a pageant. 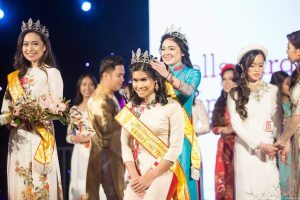 The Miss Vietnam of Southern California (MVSC) scholarship pageant is held at the largest Têt (lunar new year’s) festival outside of Vietnam. 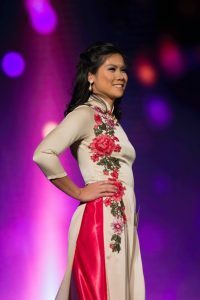 MVSC isn’t a typical pageant: 1) it is culturally focused, 2) it’s totally free for participants (including professional make-up sponsors, which saves contestants several hundred dollars), and 3) it has a reputation for genuinely supportive pageant contestants. I think this stems from the pageant’s accessibility, which attracts high-achieving women from all walks of life. I joined because I wanted to meet awesome women and to make new friends who I could relate to culturally. I never had any Vietnamese-American friends growing up in Florida. Even now that I’m in California to earn my Ph.D., I study ecology, which doesn’t attract many Asian-Americans or other minority groups. Competing in pageant is a crash course in modeling. Walking in heels is already challenging for me, so strutting across the stage without even glancing down raised the hazard level, compounded by the challenge of not tripping over my flowy áo dài (traditional Vietnamese dress). If that doesn’t sound challenging enough, once you reach the center of the stage you must effortlessly transition into a three-point turn, which is turning 360 degrees while striking three different poses. According to the Labor Department, modeling and being a scientist are listed as “opposite” jobs with non-overlapping skill sets. Learning something totally different from my day-to-day researching was a really fun, refreshing change! On a daily basis I am guilty of slouching at my desk. When I’m giving a presentation, my natural tendency is to shift my weight back and forth nervously. 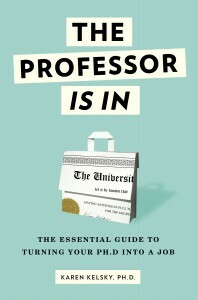 I see it in other graduate students and professors as well. When someone has presence and poise you automatically take them more seriously and listen. They stand out. During pageant practice I learned how to do a three-point turn, or a set of various poses you string together seamlessly at the end of your catwalk. I had to practice a ton with a mirror to get this to look totally effortless yet powerful. Having a confident pose that you feel comfortable standing in will make your presentations more impactful. I recommend recording yourself (video) for a few minutes while giving a presentation. Although it’s uncomfortable, observe the nervous ticks you do without even noticing. Then, practice standing in a comfortable, grounded pose. Try to maintain this pose while giving a presentation on your research. It’s hard. At first it takes focus and practice, but the investment is worth it when you’re able to command a room at a conference or seminar. This is extra important for women in academia who face additional challenges getting their research taken seriously. Plus, having good posture while sitting translates to improved circulation and breathing, which will help you write a better grant proposal! Be able to skillfully answer questions on the fly. There is a tendency for academics to prefer non-stressful time to think and generate a thoughtful answer. Unfortunately this is not the case when fielding questions after a research talk. Though this is a “thinking-on-your-feet” skill, it is one that you can practice. With a friend, you can go through a list of common interview questions (or a list of questions you are terrified will come up after your research talk). At first it will be uncomfortable, but with some practice you will surprise yourself and come up with some great answers. These can be adjusted to answer similar questions. Practicing also gives you confidence in handling unexpected questions so you’ll be less nervous and stressed. Putting yourself in difficult and challenging situations for practice will help you shine when it actually counts! 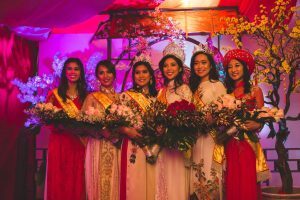 2018 Miss Vietnam of SoCal Royal Court! It’s obviously tempting to compare yourself to others when you are dancing, talking, and smiling your way up to the final rounds in pageant. However, I knew if I wanted be happy and get what I wanted out of my pageant experience (new friends), I couldn’t be comparing my body or my accomplishments against others. This is probably the hardest of the three takeaways to truly follow. In academia, it is especially easy to compare to cohort members or other postdocs or early career PIs with all the ways to quantify your success (e.g., number of publications, H-index, number of grants received, fellowships/awards, etc.). I’ve found that I’ve learned and accomplished so much over the last few years of graduate school despite feeling no different on the surface. When I think about it that way. If you can’t give up the urge to quantitatively compare something, look at your CV now versus from a few years ago. I often fall for the illusion that success is easy for others, and forget they often had several failures I didn’t see, or had devote time to practice how to speak so powerfully. As a byproduct of following these three tips, I won 1st Princess (first runner-up) at MVSC! Now, I own not only a sparkly crown and sash, but I also own my confidence in a genuine way – not just at the “fake-it-til-you-make-it” level (though it was a good start). I hope these tips from pageant can help you feel like Miss Academia!